When researching the history of Jamestown, John Smith, and Indian relations, it is difficult to steer one’s search around Pocahontas, Powhatan, and Opecancanoe. The resources on the Mannahoac Indian tribe and their relations with the English in the early years of Jamestown are less well-documented and oftentimes overlooked. As stated in the Amoroleck Encounters John Smith Historical Marker, the first meeting between the English and the Mannahoac Indians occurred in August of 1608. Thus far John Smith had not been in contact with any natives besides those associated with the Algonquian tribes (Bushnell, 3). Just prior to this particular expedition up the Rappahannock river, John Smith had befriended a Wighcocomoco Indian named Mosco who was serving as the guide of the English. Mosco guided the settlers towards the Rappahannock Falls but warned them of the hostility of the Rappahannock Indians. Mosco was certain that the Rappahannock Indians would not be willing to negotiate or be amiable towards the English, and that the group should be on guard while within this particular tribe’s territory (Lemay, 120). John Smith’s party traveled by barge up the Rappahannock River. While exploring, they were attacked abruptly by a small group of Rappahannock Indians. Arrows rained down on the men. The English settlers fought off this first attack and reassured and convinced Mosco to stay with them by rewarding him with the arrows collected from the skirmish. Safely back in the barge, the settlers continued upstream, where they were ambushed from both banks of the river by camouflaged Rappahannock Indians. Again escaping the attack, John Smith led his party further upstream as far as possible and stopped at the falls near present-day Fredericksburg (Lemay, 121). The party docked and explored the terrain. Only an hour into their ground expedition, a full-on assault was launched by the Monahoac Indians. One hundred Indians attacked. The Indians retreated, leaving behind a wounded tribesman, Amoroleck. Amoroleck was a Manahoac Indian from the Hassininga village (Bushnell, 3). The English party came to the aid of Amoroleck and helped him recover to the best of their abilities from his injuries. After Amoroleck had been calmed down, John Smith interrogated him as to what he knew about the surrounding areas and tribes. Amoroleck did not provide all that much detailed information (according to the sources available) but did respond in vague descriptions of the terrain and other tribes in the vicinity. This could be due to his unwillingness to help the whites, but it could also have been that he truthfully did not know very much about his surroundings. Amoroleck did explain that his tribe would be much more receptive to the settlers now that he had been treated kindly, and offered to speak on their behalf. Amoroleck did pull a fair amount of weight in his tribe because he was the brother of the king of Hassinnunga. Mosco advised the party to move on before the Mannahoaks came back with more men to fight (Lemay, 121). On their return journey in the barge, the Mannahoacs did return with reinforcements and showered the party with arrows once again. Mosco yelled to the Mannahoacs and made a convincing speech from the barge telling them that they need not attack this party. He explained that the English had been kind to their wounded warrior Amoroleck. He also explained that the English traveled with him as a guide and treated him as their own. With this, an agreement was struck. Two Mannahoacs swam to the barge and offered their bow and arrow as a peace offering. The two parties then traded Indian pipes for English pistols and merrily said their goodbyes. On their return journey past the Rappahannock Indians, the English party had less luck in striking a agreement (Lemay, 122). 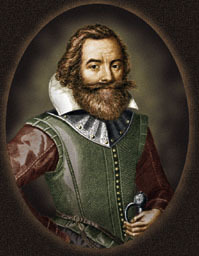 APVA Preservation Virginia, “John Smith,” http://www.apva.org/history/jsmith.html (accessed April 10, 2008). Rappahannock River Basin Commission, “The Rappahannock” (accessed April 20, 2008). Bushnell, David I. The Manahoac Tribes in Virginia, 1608. Washington, DC: The Smithsonian Institution, 1935. Swanton, John R. The Indians of the Southern United States. Washington, DC: United States Government Printing Office, 1946.